Landau Eugene Murphy Jr. AGT Champion. Season 6 of America's Got Talent proved that dreams can come true, no matter where you start your dream. Former car washer from Logan, West Virginia, Landau Eugene Murphy Jr. won the $1 Million prize and will headline a show at Caesars Palace in Las Vegas beginning on October 28th on the America's Got Talent Finale, Wednesday, September 14, 2011. Murphy, who at age 19 was homeless, became the happiest man in the world as he was crowned the king of America's premiere talent competition. Throughout the season we learned of his tough life and struggle to keep his dream alive. America fell in love with his humble and gracious persona, but his voice is what carried him to the pinnacle. No one ever expected a tall, thin, black man with long braids to become America's most popular crooner, reaching his victory by singing Frank Sinatra classics. But, thanks to AGT, dreams do come true. Silhouettes, the huge team of inspirational shadow dancers came in second, Team ILuminate's high-tech, electronic dancing placed third and POPLYFE, a dynamic pop band with loads of promise, was fourth in the America's Got Talent Finale. Even though the other three acts did not finish at the top, there were no losers in this competition. Jerry Springer, who will host the show in Las Vegas, descended to the stage from a cable and announced that the three other final four acts would all be appearing in the show at Caesars Palace, along with the best of the Top 10 and last year's winner, Michael Grimm. NBC did all it could to pack the two hour finale with superstar talent. Some of the performers included: Def Leppard, a duet featuring Tony Bennett and Queen Latifah, Stevie Wonder singing with POPLYFE, Patti Labelle and Murphy harmonizing and an incredible acrobatic performance by Cirque du Soleil from their new show Elisé. Along with the superstars, there were video highlights from the season and a performance by some of the super duds from the season. It was so awful, it was actually good and made Howie, Sharon and Piers stand and applaud. At the beginning of the season, I wrote, "This show should be called 'America's Got Stories' - because that is what it is really about - nobodies with dreams and seeing their dreams come true. Season 6 was no letdown. 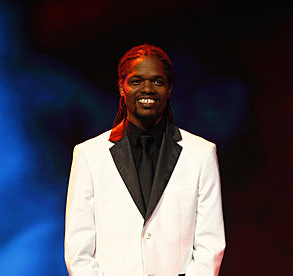 Landau Eugene Murphy Jr. wins America's Got Talent, Wednesday, September 14, 2011. A date he'll never forget and a moment we'll all cherish the rest of our lives. Dreams do come true.